I almost don’t remember last Christmas because I was so busy editing the book (and getting really, really irritated at all those commas). I feel sure that the world will go on. Have a wonderful, blessed celebration of our Savior this year. Enjoy your sweet children and families. Here’s a bit on what our “school” looks like in December. Checkers, chess, chinese checkers, Risk, Candy Land, dominoes, cards are all great for math/logic skills. Scrabble is great for spelling/reading/language skills. Puzzles – a big jigsaw puzzle can be out on the table for a few days with the whole family helping-spatial/math skills. So, that’s why I have no problem counting those weeks as school. The kids aren’t doing the normal weeks of lessons, but they are learning all those practical lessons that will help them in their homes later. Also, just a side note, after the holidays when all the new gifts are lying piled about, I get stressed out about all the stuff everywhere. I REALLY like to have a visiting grandparent occupy the kids for a few hours (or a day) while I clean and declutter and get everything all organized again. Then I feel like I can breathe and am ready to start the new year. Have a wonderful holiday season with your loved ones. 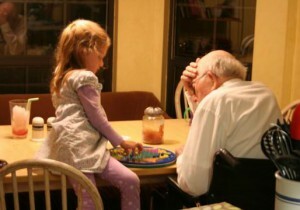 My grandpa is the one in the picture playing Chinese checkers with my daughter last year. He lived with us for two months last fall and passed away in the summer. It was a hard, busy time, but I’m so thankful for those two precious extra months with him. After the holidays are over, I tend to feel the urge to rest. I like to just cuddle up on the couch with my kids in front of a fire, and read, and if it has snowed, make snow ice cream. My favorite winter was when we kept getting snowed in and everything was cancelled. Lovely. My husband’s busy season is Jan-April, so it’s always crazy. I like to try to keep things clean and do Saturday chores so we can focus on school during the week. This year, I plan to cut out a few more things (friend birthday parties, other Saturday activities) because last year was just too busy. I cut myself some slack on dinner. Things are more relaxed because it’s just me and the kids. We have some nights of pizza in front of the TV on a blanket. I get tired. This is the season of surviving until Spring. If you’re struggling in January, congratulations! You’re normal. This entry was posted in Uncategorized and tagged Homeschooling, rhythm of a year by Charity Hawkins. Bookmark the permalink. Charity, (great pen name- you’d fit well at my house of spies !) thank you for taking time to leave me such an encouraging comment at The Overflow yesterday. I can’t explain just how perfect your timing was- as just last night I announced to my husband that I was GIVING UP on the writing thing- so discouraged by the pub world of platforms and social media and hoops to jump through. But your sweet words caused me to just hit my knees this morning (before all the kids got up and climbed on my knees) and give my whole writing dream BACK TO GOD. Thank you! Your writing is delightful-I’ve already forwarded your sight to all my homeschooling friends and bought your book for Christmas for several of them. Your voice is honest and hilarious and refreshing. Blessings as you savor this Christmas season. Isn’t it amazing how much can be learned even if you’re not “doing” school?! Again, I thought I replied to this, but yes! It is amazing! Thanks for stopping by Steph. I enjoy your blog!